Contrary to the con artists in the cyber~world we are permanently OPEN! Let me help you define and realize your particular engine combination. Straight up, great information. Based on performance, not just "sales." Buy Direct! No cores needed. Or we can build yours too. Remember - any underlined highlighted word or sentence will take you to another page about that topic. Click on it. The best sale pricing on aftermarket parts for 287" ~ +600" cubes! Do you need some one that can answer your Pontiac engine questions? Because the other salesmen can't. Talk to Bruce Fulper before you buy! PARTS, best prices!! NO CATALOGE!! You must call or Email because my prices are better than ANYONE'S, I cannot list them publicy. See all of our manufactuers below. See manufctures listing below and email with questions. BEST prices anywhere. Don't be green with envy. Buy one of our great engines or parts to build it yourself. New prices. $6400 Complete engine carb to pan, balancer to flexplate, 326", 350", 389" or 400" already broke in and looking great. All other sizes and power levels avaialble. I merely want to see all Pontiac owners enjoy their cars without spending stupid money on heavy rotating assys. 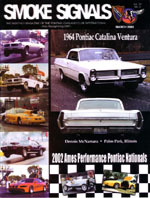 We are ~ www.PontiacEngines.com ~ Tell your friends about us. We are the very best traditional Pontiac Engine parts, combination ideas, and HELP (write or call) you'll find on the planet. NOTE: Some pages on this large site were created years ago and have old dates at the top of the page. Just added: Demon Carbs are back!! and experience to reccomend what's best for you. Dealer for JE/SRP Pistons, COMP CAMS, Edelbrock, McLeod and more. Email questions at the bottom of this page. REAL Pontiac Power delivered here. What do you want to achieve with your car? ALL of the quickest NHRA Super Stock traditional Pontiacs use Bruce's NHRA approved 428 combination. No one builds them better. Backed by documented proof. Example - Bruce Fulper's 540 hp pump gas 9.5 Cr. 87 octane 350" Pontiac engine.. It made 672 hp on a 125 shot. No heavy- rods-on-the-crank stroker bullxxx needed. Not enough? Want more? I have the recipes. Our engines are COMPLETE - Ran In-house - READY TO INSTALL. Remember that when you get your quote. No one has matched our performance, and no one can match our prices. Call us. PontiacEngines.Com. The best Pontiac engine designer and builder in the world. Ask questions and enjoy our site. I am getting the Book finished. It's taking longer than anticipated because I'm a fuss budget on particulars. The most complete guide to building your Pontiac engine with 100% confidence. Know the outcome before you begin. Watch here for news. Call or E-mail for personal help. Want a blower engine? Yes! Maybe you simply want a nice stock engine with modern efficient parts on pump gas for your GTO or Trans Am, Firebird, Grand prix, etc.? Worlds Quickest N.H.R.A. Pontiac Super Stocker nine years straight. 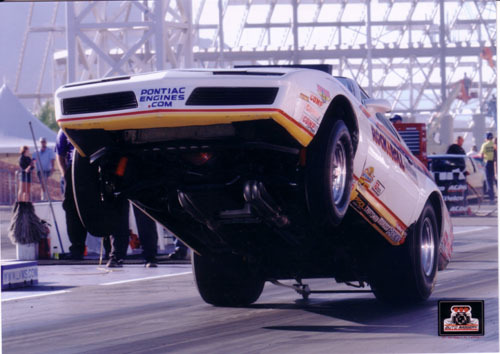 What engine combination do ALL the quickest NHRA pure Pontiac powered Super Stockers use? Bruce's!! Economy blues means new DEALS FOR YOU - Click here for a super ENGINE offer. read the rest of this site for incredible newly designed MODERN high performance Pontiac power - created by Bruce Fulper. ( Click HERE for page 2- -NEWS- You've been duped. Affordable 3"main 455 cranks are GONE!!! High Compression ~ Be Careful! carbureted Pontiac and not having problems. This is BULL. It is not my "theory." It is basic physics. Mother Nature has made these rules. If someone tell s you it's not a problem save yourself lots of grief and money and ask me first. I'm not trying to sell you anything with this info. I just want all Pontiac lovers to enjoy their engines max potential. How Sweet it is. Indy. I won Indy. I did. I won Indy. Can't say it enough. and don't forget, I won Indy! Click Here for "Labor Day 2004 Weekend at Indy"
The fastest and quickest Pontiac Powered N.H.R.A. Super Stocker GT/DA. 3310 lbs. Do the math. Uses OEM block, crank, heads and a 750 cfm Q-jet per NHRA rules. 9.67 @ 136.09 mph. 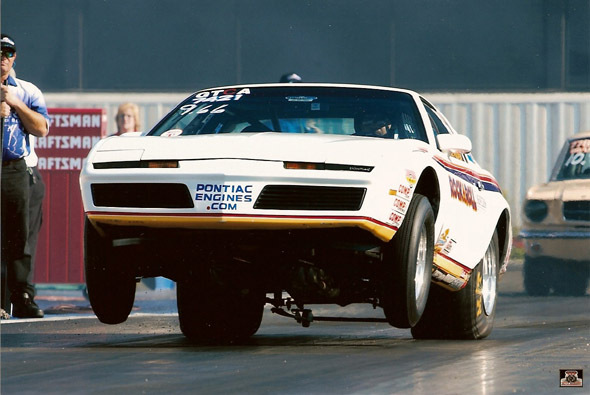 Super Stock 1982 Firebird. Used a 1968 Firebird 400" engine - Q-jet - 3245 lbs. Set an NHRA National Record May 25th, 2002. 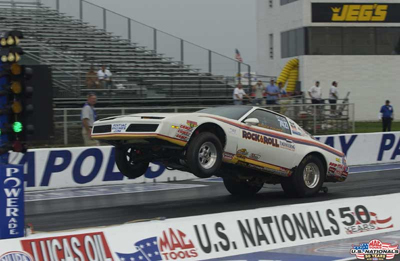 The quickest GT/DA traditional Pontiac powered Super Stocker in 2002. (Quicker than two 455's) See official stats. 2003 NHRA Winternationals qualified as the quickest GT/DA entry over two other cars. No other Pontiac specialist engine builder has achieved my professionally recorded accomplishments. To date B.F. has laid down the quickest NHRA Super Stock pure Pontiac powered pass in history. We're the only Pontiac engine builders with proven incredible results - street and strip. Another super AutoImagery.com picture. Left rear wheel is off the ground. In an 8 x 10 it's very clear. You can order this picture #0343-0238 as an 8 x 10 from their site. Just type my name into their SEARCH, or look for this photo number. Both rear wheels were off the ground at one point. Dave was lucky enough to catch it with all air under one slick. I've learned another lesson. While it looks cool, my next car won't be doing this craziness. I've made 1000 hp with a stock 400 block and a stock crank, 3.750 stroke, that ET'd at 7.96 @ 169 mph for $14,000 dollars worth of parts. How fast do you want to go. We'll get you there. Developing engines equally for massive torque and horespower. Also streetability and/or track winning only. No one compares and this site shows those facts. Take your time and cruise this great site. There's lots to see here. Whatever you need. We can provide it with care. Let us sell you the parts or build your next engine. For some of our Westech DYNO results click HERE. Hey Moto! Click here for new products. Recognized now 20 year NHRA announcer - click here for earlier reccognition. Go to our PERFORMANCE page to see the cars on this cover that use our parts. Click on any underlined or highlighted word to see more information. 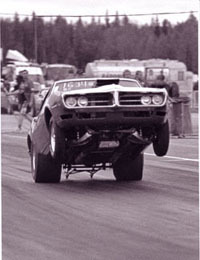 Frederick Luthstroms 8.60 second '68 Firebird from Sweden. Uses Bruce's Edelbrock heads and custom Comp roller cam. Running here in 1997. 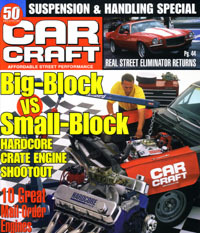 Click HERE to see our affordable CRATE ENGINE. The impromptu winner featured in Car Craft March 03. Our 455 King Street engines dominate Chevy combinations. See 05/05/03 update. Whips a 502 bowtie with ease. And is equal in power and less expensive than the new 572" Bow-tie crate engine. Rarest factory built 1965 GTO? Click here. When it was originally built and street driven by Greg Gutnecht, it ran a best of 9.11 at 149 mph using all RRE parts under the hood. No engine failures using a stock block and crank. Greg traded it to me for my '63 LeMans which is supposed to be receiving Gregs new turbo drivetrain. I sold it cause it looks too much like a Nova. I plan on building a new '65 GTO street car. Should be the fastest REAL street driven Pontiac ever. (C'mon Hot Dogs. Get ready. ) 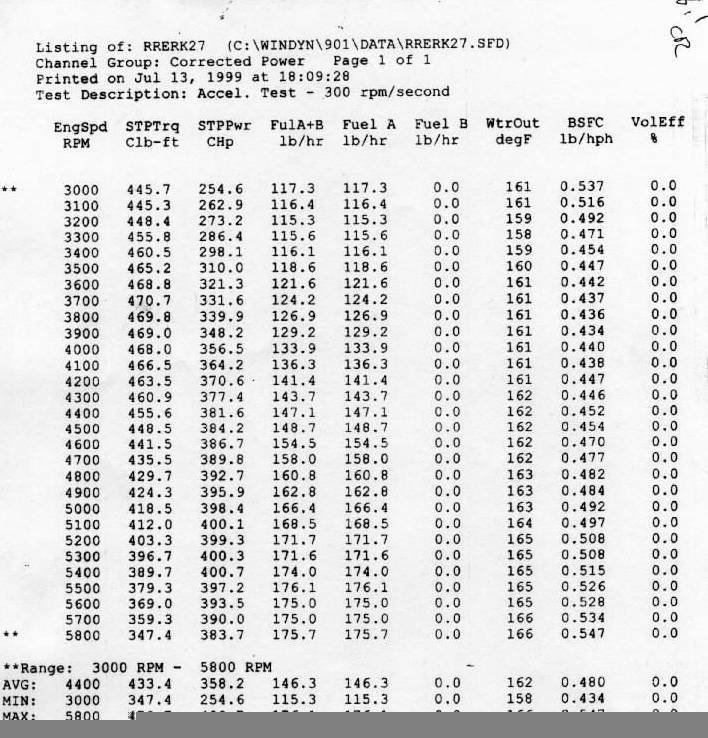 The following is a list of RRE parts Greg used. Our prepared Edelbrock heads, My custom profiled COMP CAMS roller cam and valve train, pistons, rings, BME aluminum rods, Victor intake. Greg also used my advice on gear and converter selection. Greg did his own assembly. This was a true street car at that time. It had a 3:70 gear. A 3 1/2" full length over the axle exhaust system. With three quarters of a tank of gas it weighs 3400 pounds. I used the car to test different combinations. To date I had installed six different engines from our King Street series of low octane street combinations. Number one - A 455 King Street-87, 621 lbs. ft. at 4300 rpm with a small 240's duration street cam that was built for Dennis Ryncarz Jr. It used a Mighty Demon carb and ran 11.20's at 118 mph shifting at 5500 rpm and going through the traps at 5500 rpm. Our King Street 455's redefine the old saying, "Great Low End Torque." No nitrous either. You'd love to own one. You say you'd like to add nitrous? I've got combinations that have made 800 hp and 823 lbs. ft. at 4800 rpm using only a 150 plate shot of nitrous on our King Street 455-108. Importantly these 455 engines make this power below 5500 rpm. They're designed for less stress and a normal long service life. Number two engine was a King Street 400 - Then I designed and built 8:71 blown 400" daily driver for a show car. Click on the underlined 8.71 for more info. I've built several blown Pontiacs. They're always way cool. Third engine was a King Street 428-92. It was a stock stroke/stock rod length 428 that was built for Steve Tinsman. It made, oh, just 661 hp ON PUMP GAS. People are trying to copy me - but, no one has performed better. Unlike some of our competitors - We DYNO Each Individual Engine. 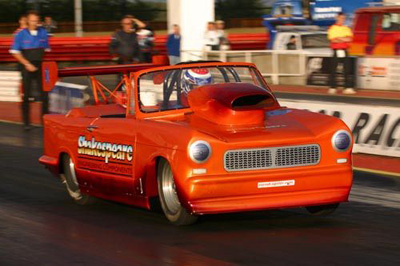 Tinsmans 'bird runs 10.70's at 127 mph on 93 octane pump gas and no nitrous. My innovative designs are stunning the Pontiac community. And best of all they're affordable. Number four engine: We installed the wild history making 9.55 compression 87 octane 539 horsepower King Street 350-87 cubic inch Pontiac I designed for Car Craft magazine. 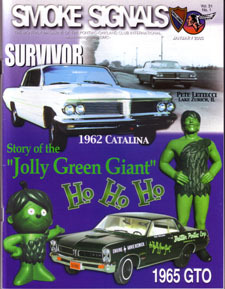 It was featured in the July 2002 issue. Although not the engine I intended to use, the 350 ended up being the used in the Popular Hot Rodding Engine Masters Challenge contest. We were the only ones that drove their engine to the test site and beat some of the top engine builders in the country. We placed thirtieth out of fifty total entries with a 10 month old street driven and often raced engine. We have reprints available. You owe it to yourself to read about this amazing 350 s-t-r-e-e-t engine. Click on the highlighted 350 for more info and pictures. Since April 2002 the 350 was raced and driven all over the country. In November 2002 this big torque little 350 beat our competitors biggest stroker 474 cubic inch engine in a heads-up race. You should have heard their excuses. (Brother..!) We hear a lot of excuses from other Pontiac engine builders. Fact was and the fact is - It was a 350 cubic inch engine thumping a 474 cubic inch stroker engine. Our "excuse" is my successful research and development. This little 9.5 Cr. Pontiac is the baddest 87 octane Pontiac 350 ever built. Don't waste your money on STROKER cranks that don't make as much power as we do with stock strokes. Spend your money on airflow. That's my "secret." I have the most killer combinations for any V-8 Pontiac. Everyone else gave up because they CANNOT make a REAL Pontiac run. Want to use an aftermarket block? I'll show you how to get the most out of those too. Our 389's, 400's, 421's 428's and 455 King Street engines are all incredibly impressive. All run on pump gas and have made as much as 669 hp without nitrous. Complete dyno'd ready to install no-frills King Street engines start at $10,500 dollars. you can upgrade to any type of cam you'd like for an additional cost. While supplies last. EDELBROCK HEAD PRICES - Wideports are losers. Ask me. 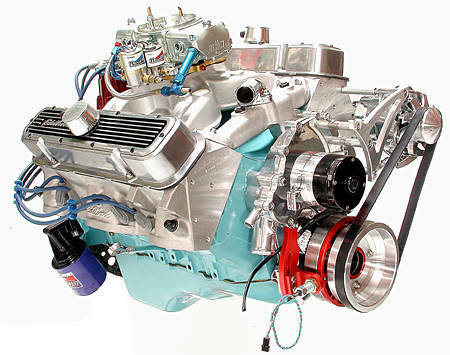 We also build highly durable and torque packed cast iron (stock) head stock Pontiac engines. Click on the word STOCK at the top of the page for just one example. $4800 includes dyno break-in, power numbers extra, and all of our modern upgrades. Performance and price - we cannot be beat. That may sound cliche', but it's true. The only complaint we get is the customer wishing they had called us first. We also build bracket race engines, circle track engines, boat engines and all out competition engines. I can also design and build other makes too. You have finally found the people that have the experience, the assembly talent, and right advice to build your Pontiac engine. The correct way the first time. Call us for personal assistance. We try very hard to make sure you know what you're doing. No more guess work. The 400 JE/SRP piston is now in stock and available in 4.160 and 4.185 bores. That's a .040 over to fit wore out .030 over blocks or .065 over for wore out .060 over blocks. Only $535 a set through us when you mention this ad. Click here to see Bruce's ex dragster. The Quickest & Fastest Pure Pontiac Powered GTO since acquiring a Bruce Fulper built 400 in 1997. Dennis "D-Thief" McDonalds' '64 GTO has won every Pontiac match race entered and nearly a hundred bracket race rounds. Engine reliability allowed D-Mac to concentrate on driving.To date: Best E.T. 8.60 Best MPH 159.35 No RRE or component related engine failures. Dennis blew it up in his shop after sneaking the crank out of it trying to find my "secrets." Didn't realize the gear drive needed aligned. Can you say mechanically UNinclined? Dolt. Jim Trettel bought and restored Bruce's old Rock & Roll GTO. All top shelf work by Jim. At 3,395lbs. 4-Speed, 10" Slicks, It made history when it ran 9.52 E.T. at 140.00 mph. It was the first all stock weight 4 speed GTO with 9" slicks in the nines and no nitrous. Bruce designed and built the 8000 rpm 421 engine for Jim. No engine failures. Bruce's 'ex 63 Tempest "Womp'em Wagon". Admired by Smokey Yunick in 1997 for its performance and special engine design. Race weight 3430 lbs. 3:90 gears. DOT tires. 400" . Custom profiled Comp Cams H.R. cam by Bruce. .242 duration. .540 lift. RRE ported 87cc Edelbrock heads. Compression is only 8.5Cr. Uses 87 octane. DYNO SHEET All other dyno sheets you see Shifted at 5500 rpm it went 11.40's at 116.50 mph. 535 hp and 500 lbs. ft. torque. No engine failures. Stock crank. Stock rod length. Buy this basic head and cam combo for $3640. Pump gas is always wallet friendly. When you want the best - you've finally found us. When you Email questions make sure you place "Pontiac question" in the subject line. And always keep your original Email included with subsequent emails. It makes it easier to follow along if the emails continue over the course of a few days. Thank you. Support those who support you.! PontiacEngines.com and pontiacengines.com are here!